This poor girl wanted her Hebrew tattoo to say a spiritual "I am free". She got her Hebrew backwards, but that's the least of her troubles. This unfortunate creation actually says "I'm for free". Really, this Hebrew tattoo beats any tramp stamp hands down! The troublemaker here is of course the word "free". In English, this one tiny word contains many meanings. There is liberty (free as a bird) and then there is without cost (a free sample). Mind, free as in "I am free" is gender specific. The free in "Free samples" is not. Or as they say in the Free/Open Source Software community, free as in beer versus free as in speach. Please send contact info for the 'Free Girl'. At that price I may just order a dozen. Seriously, the only step downhill from this unfortunate error is to even (mis-)spell Hinam backwards: Ani Maniac. Your site should be required reading before getting a tattoo. Yi'shar Hashmal, Typo. You should be aware though, this book was not originally written in Hebrew, but in Greek. i also found a translation..
is it the same as you have?? Your translation actually says "Faith is trusting in hope and relying on what's hidden from the eye". It's not a very good translation. The translation suggested by Anonymous is much better. I think it's hilarious. Maybe I'm sick. @ Anonymous: its actually is a good translation,and the Hebrew grammar is correct. 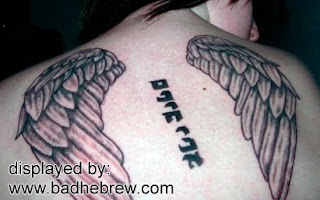 what you wrote in Hebrew I will translate as: Faith means to trust hope and count on whats hidden from the aye. its perfectly proper Hebrew grammar. Confusion, does not chinam also mean unbound? Mikhal, "Sinat Chinam" means hate without a reason. It's "Chinam" because the hated person has done nothing to earn it. So it does not save our poor tattoo. This is so horrible and so funny. with two yuds, not one.